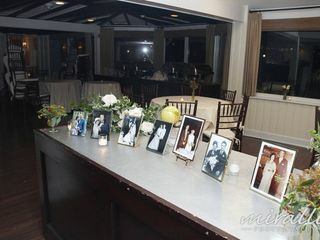 Three Village Inn is a vintage-style wedding venue located on Long Island in Stony Brook, New York. 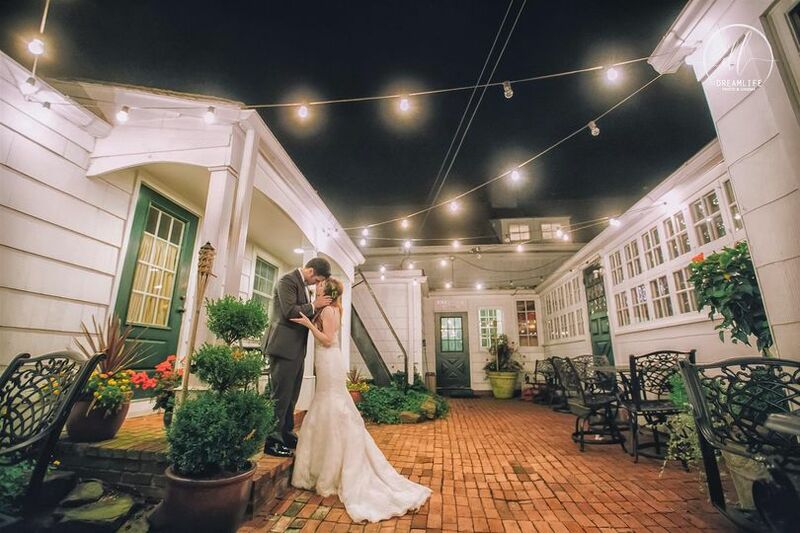 This historic inn and restaurant offers both indoor and outdoor settings for your engagement party, bridal shower, ceremony, and/or reception. 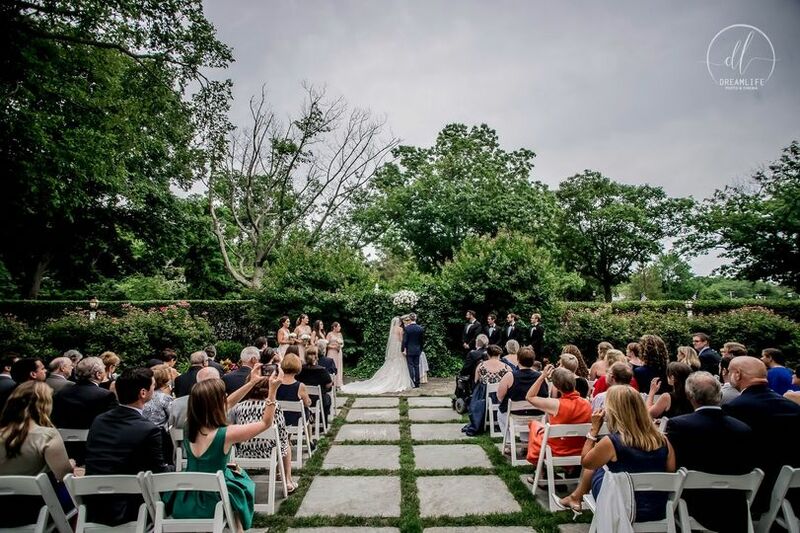 Couples and their guests will enjoy gorgeous views of Stony Brook Harbor, a beautifully landscaped property with flowers and towering elms, and multiple charming rooms to choose between. 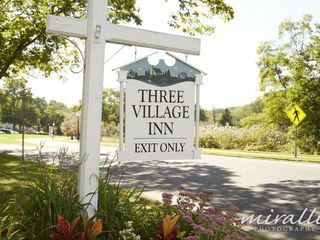 Three Village Inn, a Lessing’s Hospitality Group venue, looks forward to turning your unique vision into a reality. 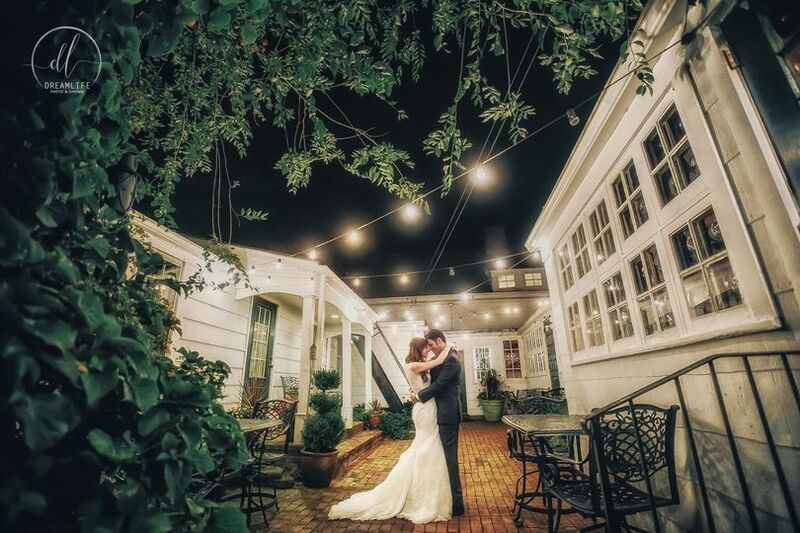 Couples can accommodate up to 250 guests at this historic 18th-century inn. 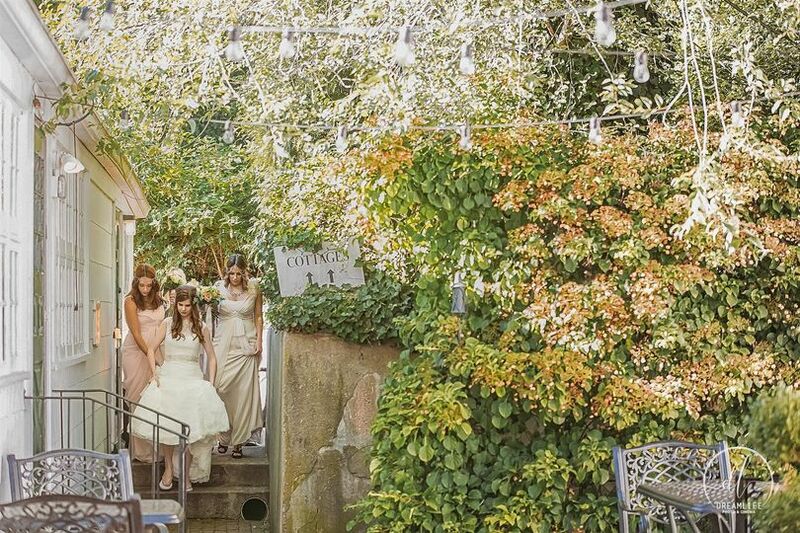 You can exchange your vows outdoors among their gorgeous gardens, underneath a white wedding arbor that stands against a hedge. 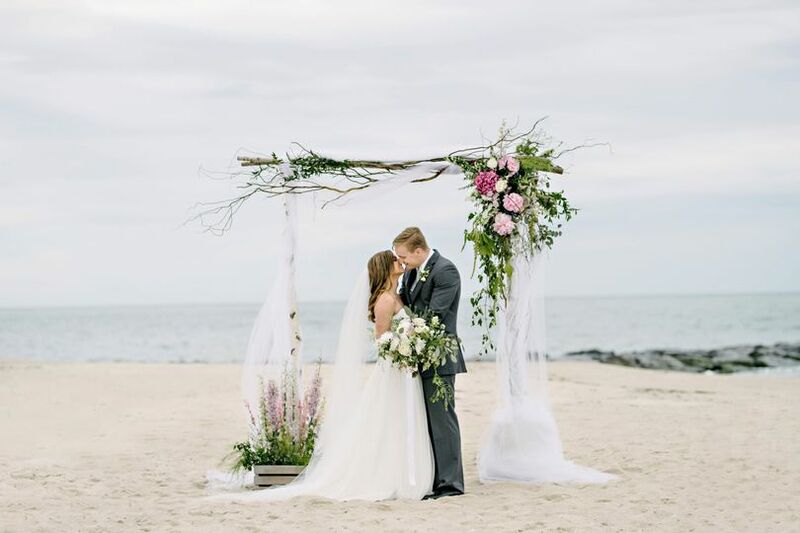 Small flowering trees and other plant life will surround you as you say your “I do’s” If you prefer an indoor celebration, or if there’s inclement weather, you can also get married inside the inn. 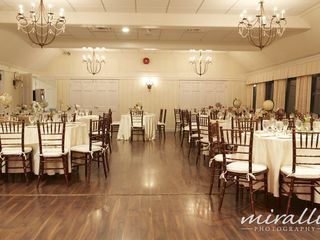 For your reception, Three Village Inn has a beautiful ballroom. This quaint room features an open floor plan that can be divided into two separate sections with the help of a heavy golden curtain. It also boasts bright windows, polished hardwood floors, and metal chandeliers with delicate accents. I don't even know where to begin in writing this review because everything at the Three Village Inn was BEYOND!! 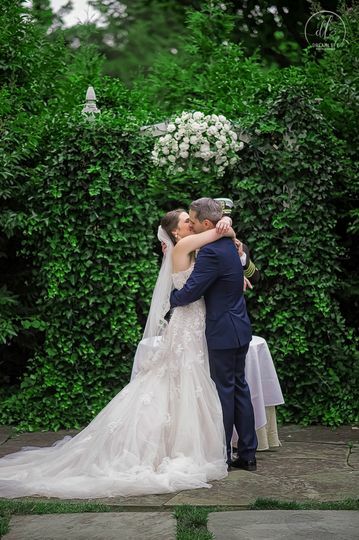 anything my husband and I could have ever dreamed of when we pictured our perfect wedding day. First, we knew The Three Village Inn was the perfect venue for our wedding because it had everything we were looking for... a rustic/intimate feel (we did not want gold, mirrors, flowered rugs, and multiple ball rooms), located in the harbor of Stony Brook with beautiful views of the water (perfect for sunset photos), a tavern for our guests to hang out in before and after our wedding and a hotel for all of our guests (which turned our wedding into a weekend of fun instead of just one night!). 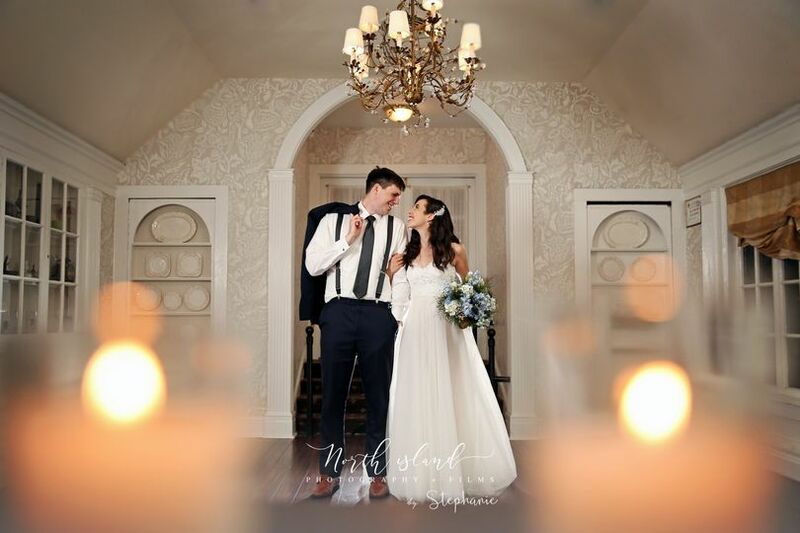 We also used another room at the Three Village Inn for our rehearsal dinner which was super convenient because our family and bridal party were all already staying on site. I can't say enough about how amazing each and every member of the staff at The Three Village Inn are! They all went out of their way to make sure every single part of our wedding was perfect. Faith, Evelyn, David, Ryan, Abby and everyone else was just so helpful, organized, and put me at ease knowing they would make everything perfect for both our reception and rehearsal dinner. The food... omg, it was unreal. The cocktail hour was beautiful, everyone loved all the choices and the food during our reception was unbelievable... people are still talking about it! The TVI was absolutely the perfect choice! Thank you so very much for your heart-warming review. 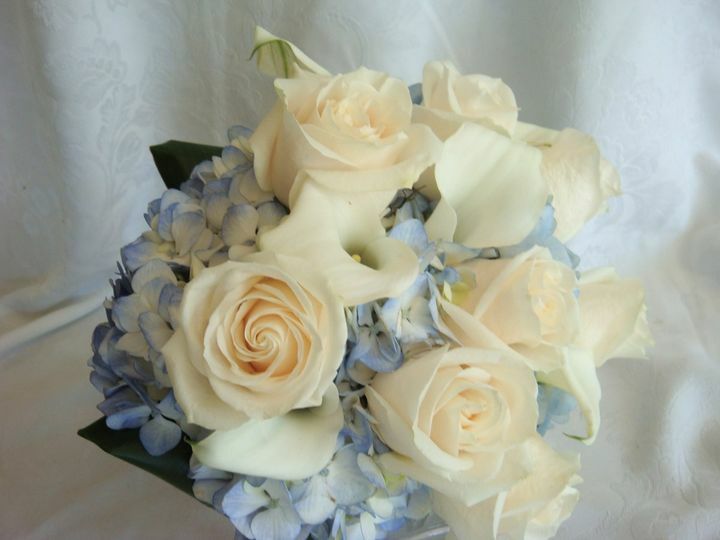 We take pride in our work to make sure your big day is as special and perfect as you have planned all along. 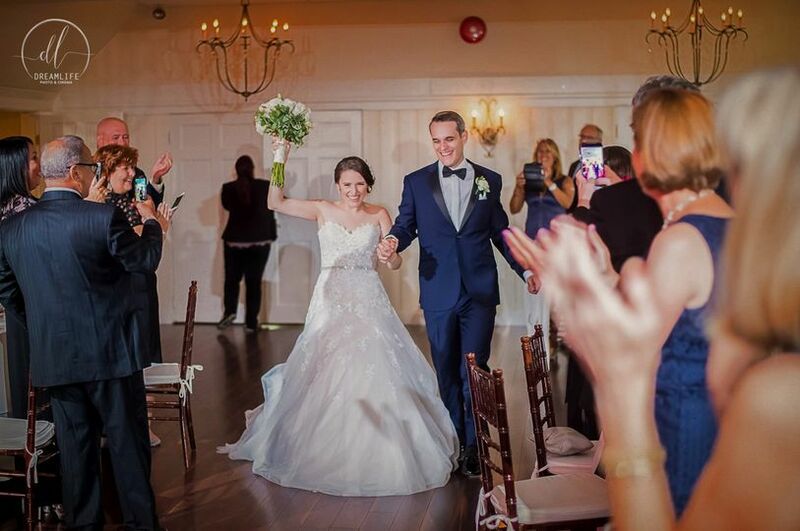 It makes us so happy to see how pleased you are with everything and we wish you many years of happiness and hope that we will one day have the plasure of hosting another one of your events with us here at the Inn!! Faith, Evelyn & the entire catering team at the Three Village Inn!!!! The Three Village Inn had to everything we wanted and dreamed of working with Stephanie was so easy and the made accommodation's for not only my sever allergy but also for my family members who had gluten allergies. The inn and cottage rooms were amazing to stay in and we were able to have the time to get ready and know everything was on site. overall I couldn't think of a better place to have out wedding. Ryan ,who is the manager of the front desk, is truly a saint door putting up with all the questions my mom asked him (I think by this point he should block her emails lol) and honestly everyone from Stephanie and Dan to the waitstaff and beyond made it the most magical day ever. When I started venue shopping all the way back in early 2016 the Three Village Inn was my second and LAST stop. I knew as soon as I walked into this quaint venue that this was where I wanted our wedding. My husband and I booked for November 2nd 2018 but that was too far away so we went and got hitched on November 2nd 2016. So the Three Village Inn hosted the wedding we never had and little did I know...the wedding of my dreams. There was so much anticipation leading up to the day but all of our TVI contacts were beyond amazing and were there for every step, email, idea change...you name it. 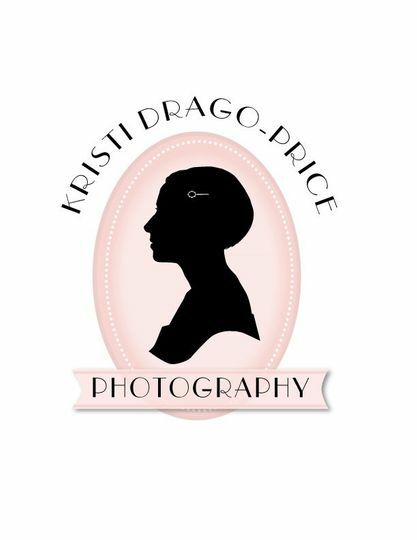 A HUGE thank you goes out to our Maitre D Stephanie, who was literally there for me in every way from dress malfunctions, champagne pours, happy tears, bathroom breaks...EVERYTHING!!!! Thank you from the bottom of my heart your hard work and dedication to your role did not go unnoticed!! Ryan, TVI’s hotel manager, his communication and follow up skills are on point. Being a very responsive person myself; I really appreciated this trait of his. Staff, although we may not have spoken, your hard work showed and you all were complimented by our guest for your outstanding service. Food, WOW. More than 5 stars! Quality, portion and presentation was all there!! Cake, I didn’t get to eat it that night, but Stephanie sent us home with the whole top to eat- NOT FREEZE and to contact them before our next anniversary and they would supply us with our identical cake. WHO DOES THAT!? Besides that great news, when we did eat that cake, we couldn’t stop. Limo service, although we didn’t use much of their service. Our driver was so sweet and wanted to be there for me in every way. I didn’t get to thank him for that so I hope he reads this one day! Flowers, STUNNING!! 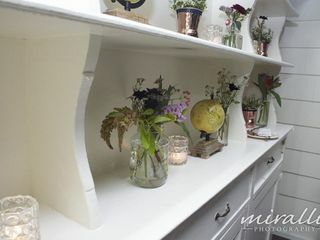 Please go to Village Florist and Events Facebook page to read my review. The way they set up all of our wedding decorations, blew my mind. It was better than I had imagined it being and that is so special to me. The Three Village Inn exceeded our expectations in so many ways and we will be forever grateful. 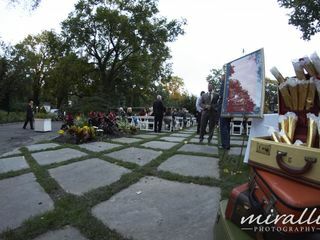 By the way, the cake, limo and flowers were all included in a package TVI offers; amongst other vendors! 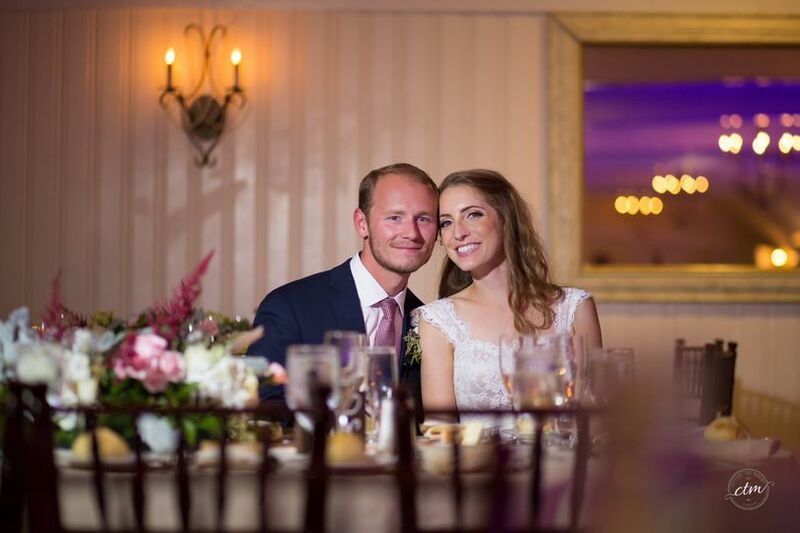 If you are looking for a smaller, classic, romantic dream of a wedding, Look no further and book with the Three Village Inn. The antithesis of the Long Island wedding factory, the Three Village Inn is as welcoming as it is quaint. 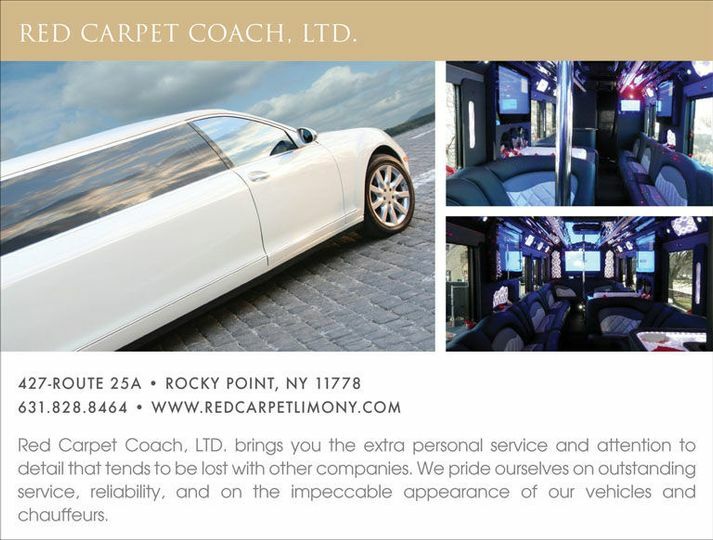 Perfect for local or New York City couples who want it ALL in one location. 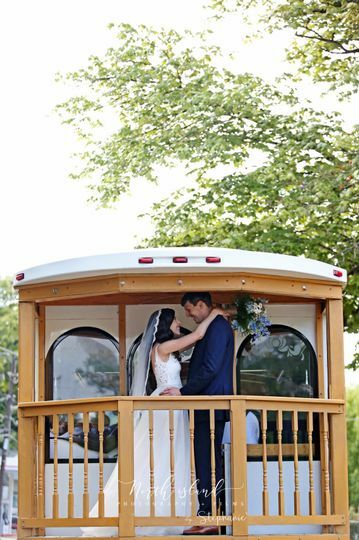 On site guest cabins, outdoor ceremony option, a tasteful reception room and steps away from the photogenic Long Island sound. One of my very favorite venues. Wonderfully intimate and charming! 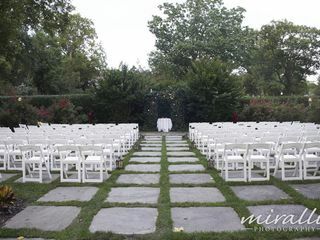 Three Village Inn is a beautiful, quaint, classic venue to cater any event for any occasion. 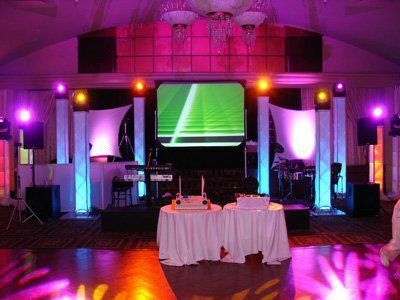 They treat everyone with dignity and respect; cater to everyone&apos;s needs, and make sure that each event is seamless for you from beginning to end including beautiful surroundings and delicious food. 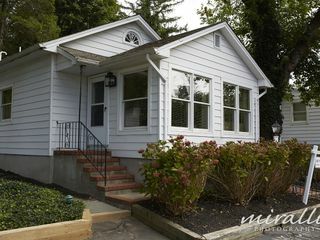 Their location being in the heart of Stony Brook, nestled in by the harbor which makes for a picturesque view. We highly recommend Three Village Inn to cater your special event!